Have you heard of the brands IPKN and Arrow? They were new to me as of about a month ago. 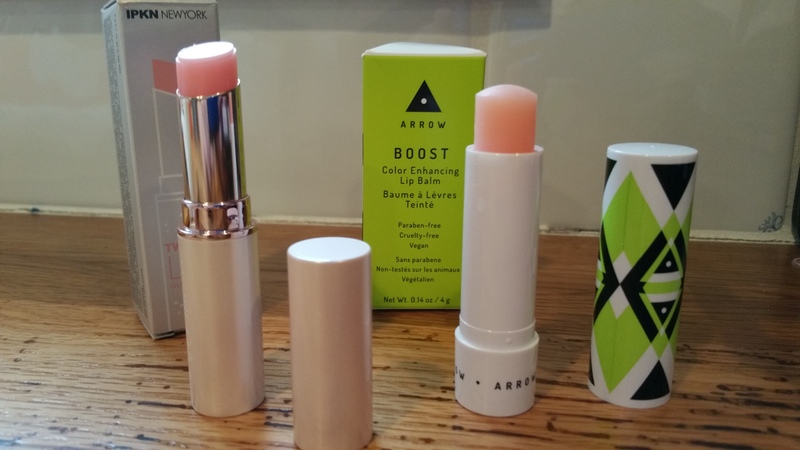 I noticed them on Birchbox.com, where Arrow is being sampled this month. I don’t know the whole scoop on IPKN– I could have sworn it was a Korean brand, but then I found out that its name stands for: “Independent Professional Knowledgeable New Yorker, IPKN.” So, perhaps it’s a Korean brand made for New Yorkers…? I’ll stop foolishly speculating. But if you do know, please comment at the bottom of the post. I picked these two brands to sample because they both make a color adjusting lip balm and were not outrageously expensive. So come along while I introduce these guys and show you some swatches. IPKN Twinkle Lips – Glow Pink comes in a thin-ish twist up stick, whereas Arrow comes in a traditional balm tube. Even though Arrow’s tube is made out of light plastic, I was more impressed by Arrow than by IPKN. Arrow Boost balm reminds me of my cherished blue stick Nivea Kiss of Moisture balm (which, by the way, I have on “subscribe and save” to be delivered in mass quantities every 4 months), and felt similar to Nivea during application. Arrow gives off a slight minty smell, but not enough to bother me. And neither product had any tingly affects or annoying and distracting qualities (ahem, such as menthol). Arrow also gave me an (unexpected) glossy look, which is probably due to the butter and oil in it. On the other hand, IPKN was a bit dry and just bland for me. But I can certainly picture myself keeping an Arrow balm in my pocket for frequent reapplication. I had fun with both of these products. They’re brand new to me and a bit funky. But IPKN didn’t wow me and I probably won’t buy from that brand anymore. Have you tried anything from these brands yet?